The next three shops were on the Carrier property against the factory entrance. In those days shops were not always occupied, and these shops were empty for some years. 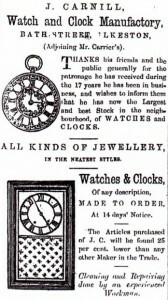 In 1871 these three shops were at 110-112 Bath Street. 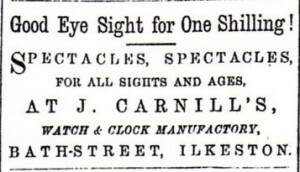 Mr. Joseph Carnill, watch and clock maker, took the lower shop. He also worked a warp frame at Carrier’s. Son of Bramcote lacemaker Stephen and Mary (nee Hewitt), Joseph Carnill married Hannah Elizabeth Thornely, daughter of Wollaton farmer William and Mary (nee Weston) in September 1857. 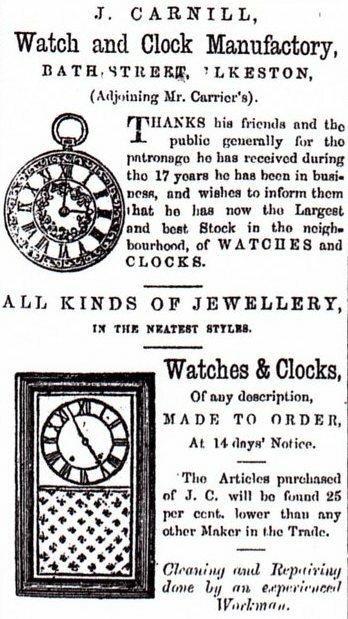 At the beginning of 1858 lacemaker and watch and clock maker Joseph took over the shop recently occupied by Edwin Wragg, close by the Pioneer offices in Bath Street; Edwin had moved into the Market Place. Hannah Elizabeth died in 1865, aged 29. In 1868 Joseph married Emily Cliffe Wells, daughter of shoemaker Thomas and Amelia (nee Parkin) of Beckingham, Nottinghamshire. The family moved to Basford in the mid-1870’s where Joseph continued to trade. We shall meet John later as we walk around the corner into East Street. However, before John moved into this Bath Street shop it was occupied, for a brief period, by cordwainer Samuel Shaw. He was the son of William and Mary (nee Mather) — and thus was the younger brother of builder Frederick, the older brother of Hannah who married carpenter James Frederick Straw of Stanton Road, and the older brother of Mary who married Samuel Rice of Park Road. Almost two years after the death of his father (December 12th 1863), Samuel married Mary Ann Boam (September 12th 1865). She was the oldest daughter of Henry and Ellen (nee Chambers) — born in Shipley, Derbyshire, her father was a stockinger, later a coal agent and then a coal contractor/merchant, trading in Derby where he was eventually appointed Mayor of that city (1895). Just over a year after his marriage Samuel was an unsuccessful and bankrupt shoemaker. He owed money to draper Joseph Carrier for rent on this shop property, to Thomas Barker for rent on a recently-vacated workshop property in Lees Yard, and to George Tooth for raw materials. There were several other debts owed to out-of-town tradesmen. In total he was over £163 ‘out of pocket’. Included in this was the sum of about £13 owed to his father-in-law .. and it was with Henry Boam that Samuel now went to live, leaving behind his Bath Street home and shop. In the week before his confirmed bankruptcy at the end of November 1866, it was alleged that Samuel had removed several items of furniture and belongings from his home, in an effort to take them out of the reach of his creditors. 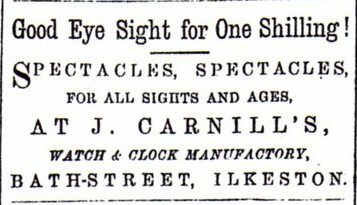 In this unlawful subterfuge the shoemaker had been aided by father-in-law Henry Boam and landlord Joseph Carrier … who both, as creditors, had a vested interest in this enterprise. A sofa, a set of drawers, a stitching machine and a hamper filled with smaller items belonging to Samuel were found on Joseph’s property, next door to Samuel’s shop. The furniture had been bought by Joseph while the stitching machine was being held as security by Henry against loan to Samuel — at least that is what the’ abductors’ were claiming !! This argument was not accepted however, and the items were seized and sold by an officer of the bankruptcy court. but the top shop had a succession of tenants, one being Mrs. John Barron, general store. John Baron was Wesleyan Methodist minister who in 1861 was living in Chapel Yard, South Street, next to the Wesleyan Methodist chapel there, with his wife Elizabeth (nee Bridge?). Was she ‘Mrs. John Barron’? White’s Directory of 1865 shows confectioner Elizabeth Barron trading in Bath Street. And we can now enter the factory yard of Henry Carrier and Sons.